As you can see in the photo above, there's a button labeled STOP right next to the QUICK START button. Its function is to gradually decrease the speed while displaying a blinking message that says: "Cool down". It takes a minute or so before the machine comes to a halt, which is just fine at the end of a run. However, there's a second function to stop the machine that could be called an "emergency stop". I've never been in an emergency on a running machine, but I imagine the designers thought about cases of "shoelace caught in the moving parts of the machine" or "sudden dizziness while running". Fair enough. I never tried this function, but it is clear that its purpose must be to bring the machine to a halt as quickly as possible. 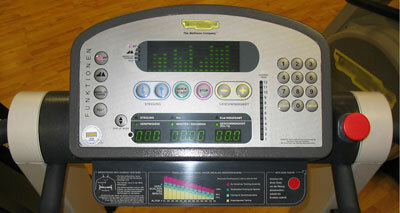 Press this button to stop the exercise if there is a problem. The control panel of the machine uses this special kind of button that is almost completely flat (you only sense a vague "clicking" motion when pressing them). These are great for devices that need regular cleaning because you can cover them with a waterproof plastic coating cover so that no liquid or dirt can get in any cracks or spaces. The problem is that you could think the red circle in the picture was one of them. This is not the case. It is just an illustration of the real button (like a figure in a piece of technical documentation) and thus part of the instructions on how to use the emergency stop function. A button that is labeled STOP although it does not stop the machine, it slows it down very slowly. A wordy explanation of what the real stop button is for. Should you ever need it, you will not have the time or inclination to read. This explanation is not located on or next to the button that you have to use to execute the function. It uses an arrow to point at the real button. 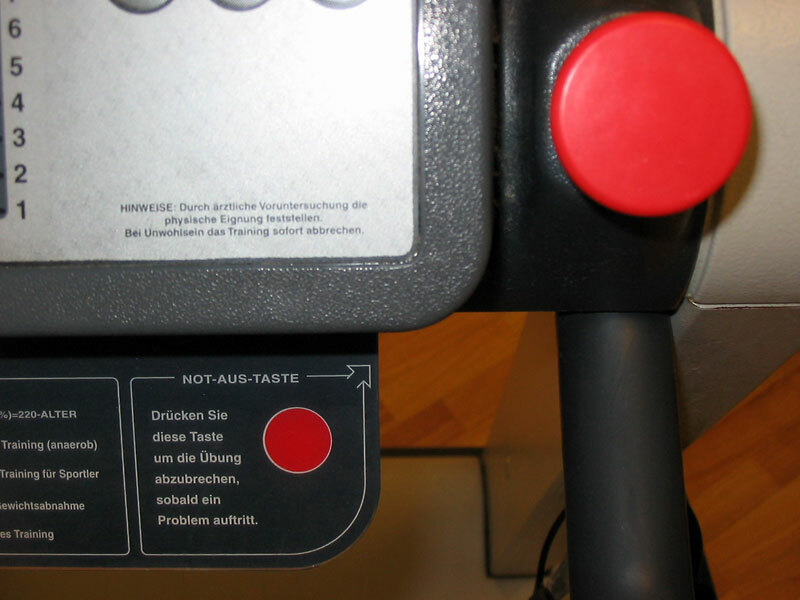 The explanation uses a picture of the button as an illustration that can be mistaken for the real button. If you press it, nothing happens. Depending on the type of emergency, you might get only one chance to hit a button before falling off the machine. Too bad when you choose the picture instead of the real button. 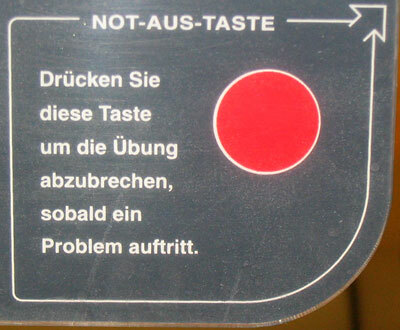 The explanation uses a demonstrative pronoun ("diese Taste" = "this button") which implies that the user already knows which button is referred to (before looking at the target the arrow points to). 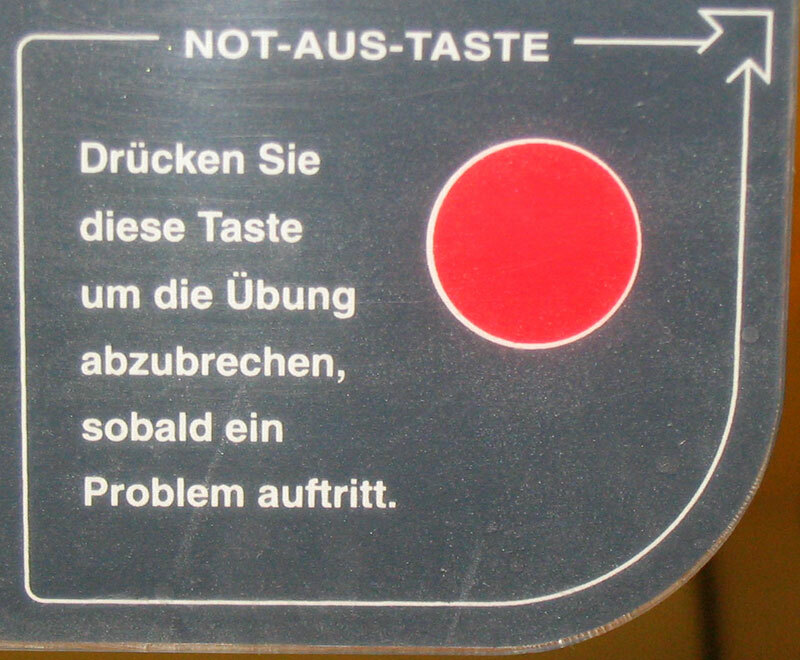 The explanation is in German only, but used in an environment where many potential users speak little or no German. The real emergency stop button has no label. The real emergency button is located where you won't be able to reach it when you are in danger of falling off the machine. Change the label of the button that is labeled STOP to COOL DOWN, PHASE OUT or something similar. Get rid of the wordy explanation and the illustration of the button. Use large black letters to label the emergency stop button with the one word that is widely understood to bring something to an end immediately: STOP. Install several identical emergency stop buttons on different parts of the machine. It's true, when you look at the full control panel, you will realize that it did not take me very long to figure out what the problem was, so it cannot be that bad. But then I was in my relaxed lunch break run mode with lots of cognitive resources to pore over the design problem at hand. Any poor fellow getting himself into an emergency situation on the running machine will be grateful for some extra time to actually execute the stop function instead of reading unnecessary instructions on how to use it.